Battle for Storm Hill is the twenty-third level of Donkey Kong Jungle Beat and the first area of the Durian Kingdom. In this level, Donkey Kong ascends to the top of Storm Hill. Cannonballs rain from the sky here, and they can easily hit the ape if he is not careful. Many Ninjapes also appear here and use a variety of attacks to slow down Donkey Kong, such as throwing shuriken, manning cannons, and directly fighting him. There is a fort in the level as well, and Donkey Kong must avoid the many Mini Elephant Cannons to climb it safely. Once Donkey Kong bites into the giant durian at the end of the level, the ape heads on to Aerie Fortress. This level's background music returns in Super Smash Bros. Brawl, where it is one of the tracks available for play on Rumble Falls and a recurring track in The Subspace Emissary, playing during the raft segment of The Lake and the fights against the shadowy clones of Donkey Kong and Diddy Kong in The Great Maze. It is used again in Super Smash Bros. for Wii U, where it is one Jungle Hijinxs's available tracks. In Super Smash Bros. Ultimate, it can be played on any Donkey Kong stage. At the beginning of this level, there is a a group of three strange flowers placed near Donkey Kong. If they are hit by his Sound Wave Attack, they can give the ape some bananas. The path ahead is very barren, but has some cannonballs falling towards it. Several Kamikami appear near the beginning, and poison the ape if they latch onto him. The path ahead eventually leads the Kong to some black Ninjapes, which attempt to hit him with their swords. However, they can be disposed of by clapping when their swords are raised, which causes them to get struck by lightning. After the ape heads down a small, but steep, hill, a Kiba Pig Poppo enemy begins to dash towards him. Once the enemy is defeated, Donkey Kong can continue down the barren area, fighting more black Ninjapes on the way. As the Kong progresses, the path becomes more flattened, and another Kiba Pig Poppo rushes into him. Once the foe is defeated, Donkey Kong can head over some small hills, passing a Mini Slump Bird on the way. More Ninjapes are farther ahead of here, along with a lone green Ninjape, which can be followed into a tall fort. At the entrance of the fort, there is a Mini Elephant Cannon being controlled by a red Ninjape. Donkey Kong can take control of the cannon to shoot the next three Mini Elephant Cannons, which are located on a few stair-like platforms farther ahead. A rope is located behind the cannons, and it can help the ape swing to a wall. Donkey Kong is able to wall jump up the wall with the wall to the right of it to reach a higher platform, where a Helper Monkey can be found. 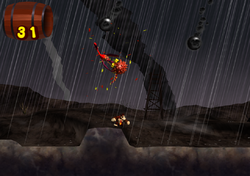 This monkey throws him upwards past a cannon and onto an even higher platform. Here, another Mini Elephant Cannon can be found, as well as two walls that the ape can climb. At the top of the walls to the right is a Fire Pig Poppo. Once the foe is defeated, the Kong can advance to a tightrope. He can slide down this tilted rope, while jumping over a few platforms that are occupied by blue Ninjapes, to make his way into a room with some bananas. As he goes to grab these items, the wall behind him closes. If Donkey Kong is to fall while sliding down the tightrope, he lands in a low area filled with more Ninjapes. A few gaps are in this area, and they are filled with some spikes. Once Donkey Kong manages to find the meeting point of the two pathways, he can follow a green Ninjape to a group of small, yellow fairies. The fairies, when hit by a sound wave, form an orange trampoline, which the ape can bounce on to progress. The trampoline sends him outside of the room, where a trapdoor closes under him. A Dan Spider is located above the ape at this point. This one is faster than the one fought at Cactus Mine. While fighting it, four blue Ninjapes throw their weapons at him. When the Dan Spider is defeated, the Ninjapes disappear, and a giant durian appears on a nearby tree branch. After optionally grabbing the three Banana Bunches lined up against the wall to the left, the Kong can head over to the fruit and bite into it to end the level. Unlike other levels, the music does not change when a Pig Poppo is onscreen. This is the only level, other than the closing ceremony post Ghastly King, where Donkey Kong is not sitting down at the start. He is instead standing in triumph with an angry expression and arms crossed. This page was last edited on April 22, 2019, at 14:41.